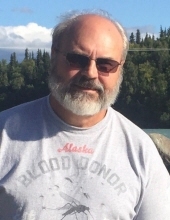 Michael Andrew Sarisky, age 64, passed away at his home in Kenai, Alaska on March 28, 2019 from natural causes. He was born in Cleveland, Ohio on December 23, 1954 to Andrew and Gracia Sarisky. His early childhood was spent in Ohio. His family fulfilled a years’ long dream, moving to Alaska in 1969. Michael graduated from Dimond High School in Anchorage in 1973. He attended Denver Automotive and Diesel College in Colorado before enlisting in the Navy in 1975. After his enlistment was up he returned to Alaska, attending the University of Alaska-Fairbanks for a time. He also worked in Anchorage at both Montgomery Ward’s and at Sears as a mechanic, before reenlisting in the Navy, serving until late 1989. For the next twenty years, he lived in Washington, except for returning to Alaska for a few years in the early 1990’s during which he owned a home on K-Beach Road and worked at the Kenai Kmart. Throughout his years in Washington he worked at various jobs that primarily made use of his considerable skill as a mechanic. Michael returned to Alaska permanently in the summer of 2009, nearly single-handedly building his home in Kenai. His artistry and craftsmanship, and ability to do just about anything (a true “jack of all trades”) continually amazed family and friends. While building his home, he also worked for the Kenai Walmart. He worked there from before it actually opened until he retired, just two years ago. He enjoyed fishing the Kenai River and dipping for reds. He loved nature and exploring the woods around his home. He loved keeping track of the wildlife that visited his property. He was an avid NASCAR fan. He loved to travel to racing events and amusement parks. Michael also loved listening to and following many of the bands of the 70’s and 80’s. He was a proud recent “graduate” of the “Citizen Trooper Academy.” He was comfortable calling the Kenai Police Department if he needed their help to keep his neighborhood safe. He loved his dog, Shandy, his faithful companion. Michael was preceded in death by his parents, grandparents, and several aunts, uncles and friends. He is survived by his sister, Paula, and her husband Charlie Carpenter of Anchorage and his sister, Karla, and her husband Paul Smith of Nikiski, Alaska. He especially loved being “Uncle Mike” to Kristin (Charlie) Krom and their children Eamon, Brennan, Callum and Ailsa of Baku, Azerbaijan, Kathryn (Sam) Taylor and their children Wesley, Asher, Finnegan and Piper of Bozeman, MT, Patrick Carpenter of Anchorage, AK and Colleen Carpenter of Pittsburgh, PA, Nathan (Ellie) Smith of Eagle River, AK and Justin Smith of Anchorage, AK. He leaves extended family in Ohio and Arizona, as well as many friends, especially Mark Watson and Rocky Lyon, both of Washington, and wonderful supportive friends, Don and Irma of Kenai. The family will hold a private service at a later date. Donations in Michael’s memory may be made to the American Heart Association, to a charity honoring veterans or to a charity of the donor’s choice. Please feel free to sign the online guestbook. He is loved so much and will be dearly missed. Arrangements were handled by Peninsula Memorial Chapel. Please be sure to sign his online guestbook. "Email Address" would like to share the life celebration of Michael A. Sarisky. Click on the "link" to go to share a favorite memory or leave a condolence message for the family.